In the first Jurassic Park film, three Dilophosaurus animatronics were created by Stan Winston Studios for the scene in which Dennis Nedry meets his demise. 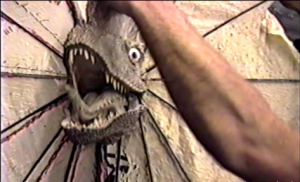 The Dilophosaurus had no CGI scenes in the film and its entire performance was animatronic. The Dilophosaurus was designed by artist Mark “Crash” McCreery, of Stan Winston Studios, and Dr. Mark Hallett. 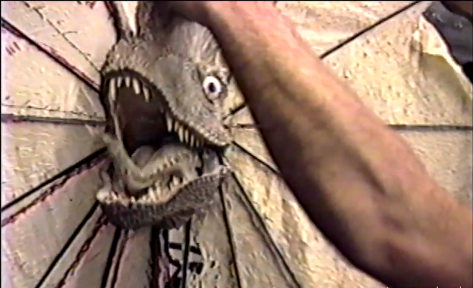 To help the audience distinguish the Dilophosaurus from the Velociraptors, the animal was scaled down immensely. A frill, similar to that of a Frilled Lizard from Australia, was also added to the design. Rick Galinson was the lead mechanical designer for the Dilophosaurus and marked his first time being the lead on any project by the studio. Using a go-motion maquette of a Velociraptor, Galinson tested the proposed hopping gait for the Dilophosaurus based on the movements of ostriches. 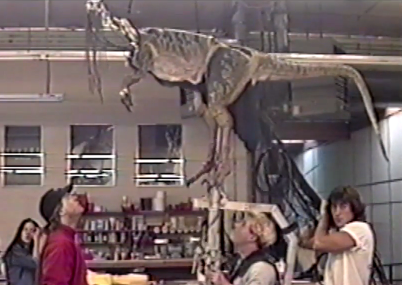 To give the illusion that the full-sized Dilophosaurus was walking, poles were attached to the feet of the animatronic and operator Shane Mahan would carry the animatronic via a channel in the floor of the set while using the poles to animate the leg joints. Each pole had a controller that allowed the operator to control the movement of the toes. Movement for the neck was caused by three jointed mechanisms; two allowing side to side motion and one for the up and down movement. Each of the mechanisms was spring-loaded, with each being sprung to carry a specific load in order to create the life-like movement. The Dilophosaurus frill was a simple mechanism created by a sheet of latex rubber glued to support rods that were activated by a pulley. The tongue was also given movement by a two stage tentacle mechanism. Underneath the tongue were two holes connected to tubing that ran down into the body cavity. The tubing was connected to a paintball mechanism where pressurized air would “spit venom.” The venom was a simple mixture of methacyl, KY Jelly, and food coloring. For the Dilophosaurus, the sound recordings of a howler monkey, rattlesnake, swan, and hawk were used to create it’s vocalizations. 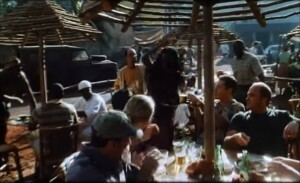 For the hooting sound, a howler monkey’s unique hoot as well as the sounds of a swan were combined to give the haunting hooting sound that first alerts Dennis Nedry to the animal’s presence in the film. A hawk screech, the swan hissing, and a rattlesnake’s tail shaking were combine to create the famous attack screech of the Dilophosaurus as she exposes her frill and spits her venom.